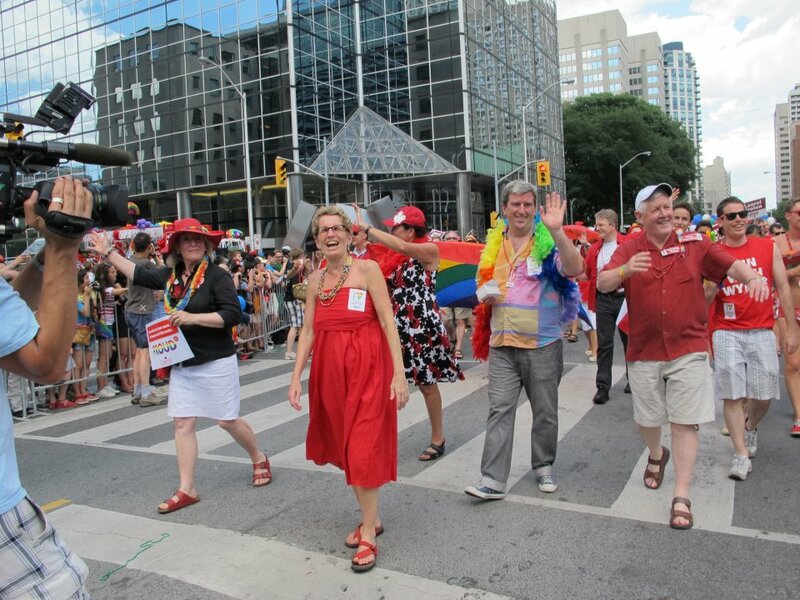 Kathleen Wynne marches in the 2012 Toronto Pride Parade with interim federal Liberal Leader Bob Rae. January 26, 2013 was an historic day for Ontario and for Canada as a whole. During that last weekend of January, the Liberal Party of Ontario elected a new leader and in turn a new premier for the province. At the end of the leadership convention, from an initial slate of seven candidates, Kathleen Wynne was chosen as the new leader. Officially sworn in on February 11, Ms. Wynne became Ontario’s first female premier and Canada’s first openly gay head of a provincial or territorial government. Ms. Wynne was first elected in 2003 as Member of the Provincial Parliament (MPP) to represent the riding of Don Valley West. Wynne served in the cabinet of Liberal Premier Dalton McGuinty as Minster of Education, Minister of Transportation and finally Minister of Municipal Affairs, Housing and Aboriginal Affairs. Before becoming an MPP, Wynne was a school trustee and she holds a Bachelor of Arts from Queens, Masters of Arts- Linguistics from University of Toronto and a Masters in Adult Education from Ontario Institute for Studies in Education (OISE). Additionally, she is respected for her skill and accomplishments in mediation which will certainly be a help in her role as Premier. Wynne has a wife, 3 children, and lives in North Toronto. This is a milestone for Canada’s LBGTQI community, for it was a mere 28 years ago that the first out politician, Maurice Richard, was elected to Quebec's National Assembly. Svend Robinson, one of Canada's most noted openly gay politicians, was was an NDP MP from 1979-2004. Mr. Robinson came out publicly in 1988. Closer to home Scott Brison, MP for Kings-Hants has been out since 2002 and Krista Snow was the first out HRM Councillor elected in 2003. As we gain more rights in Canada, and are on a more level playing field with our heterosexual counterparts, having elected LBGTQI peoples in government remains important. Having diverse representation at all levels of government is crucial to providing different perspectives and balance to governing bodies. Governments including of LBGTQI, African-Canadians, women, Aboriginal Canadians and new comers to Canada will help to ensure we develop policies that are as diverse, equal and accepting as the communities they strive to represent. In the next Nova Scotia provincial election, if you live in the riding of Dartmouth North you have an opportunity to elect the first openly gay MLA. Joanne Bernard will be running under the Liberal banner to represent the people of Dartmouth North. Joanne Bernard is the current Executive Director of Alice Housing and is involved in many volunteer pursuits in the community dealing with housing, addiction, domestic violence and women’s issues. Joanne is a mother, and lives in North Dartmouth with her wife and their cats. Bryn Jones-Vaillancourt is an active member of HRM's LGBTQ Community with a keen interest in local politics. He ran as a candidate for Halifax Regional Council in Dartmouth Centre.